Home / Weekly Newsletter / Are the Little Things Scrapbook Worthy? Are the Little Things Scrapbook Worthy? Maybe that’s the reason I’m a scrapbooker. Because, after all, that’s what our scrapbooks are, right? One big, continuous story. Do all my stories belong in my scrapbooks? Are they all worthy of the ink or megabytes on my hard drive? Take this story, for example. Outside my office window is a mixture of bird feeders. I love to sit (procrastinating my to-do list) and watch a wide variety of feathered cuties flit in and out of the oasis I’ve created for them. Last year for my birthday, my sister, knowing about my love of birds, sent me a snowman bird feeder. 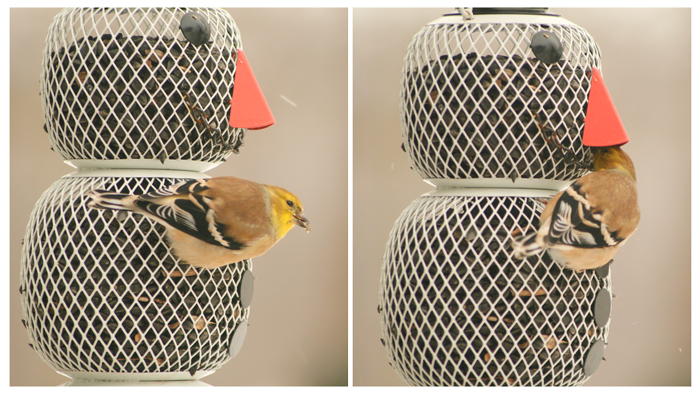 It proudly hangs out front and supplies sunflower seeds to yellow finches and anyone else brave enough to conquer it. Fast forward to last week. 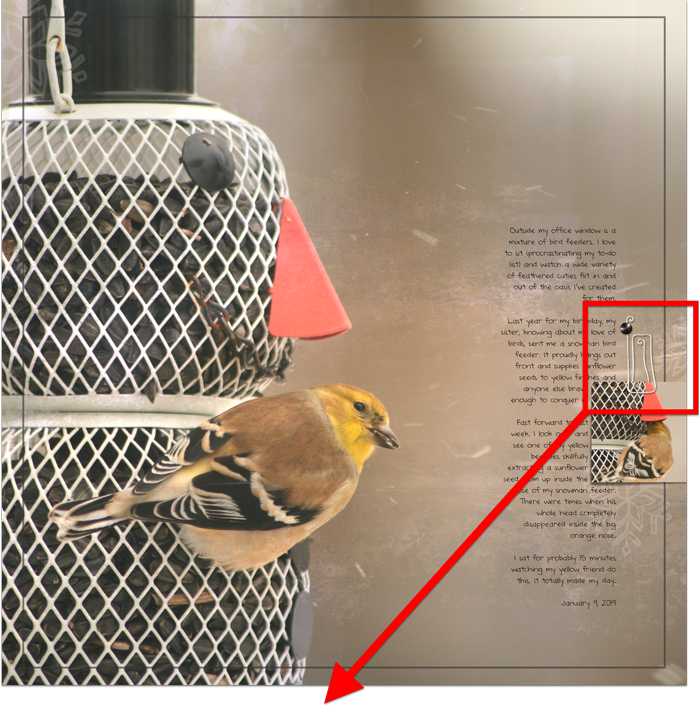 I look over and see one of my yellow beauties skillfully extracting a sunflower seed from up inside the nose of my snowman feeder. There were times when his whole head completely disappeared inside the big orange nose. I sat for probably 15 minutes watching my yellow friend do this. It totally made my day. My scrapbooks (and online galleries) are not only a reflection of those I love, but they are a reflection of me – my interests, my creativity, and all the little things I love. It’s often the little things in life that bring the most joy. I want to remember those things and reap their benefits years, and even decades, from now. Money and megabytes? Eh. Eggs are 69¢ a dozen here in northern Indiana. I think I can spring for ink! So, I’m wondering. What would you do in my situation? Do you scrap the little things? If you don’t scrap them, what do you do instead? I’d love to hear what you think. Reply to this email or comment on my post in Community. Before you go, make sure to check out my latest FREE VIDEO on the blog. Details below. Realistically attaching a paperclip to a piece of paper or a photo isn’t hard, it’s just a matter of making sure to get the shadowing right. ⇒ Includes a free fancy clip! Most of my life is made up of the “little things!” This is a sweet “little” story. I LOVE this article! I recently started feeding the deer for the winter, as well as the birds. I sit for quite a while watching both in the front and back yard. I will be including them in my scrapbooks because this year I have decided to document “me” more!